Because I am away in Moscow teaching an intensive course, I am interrupting the normal thematic flow of postings here at the Interfaithfulness blog in favor of a special series, for at least the next four days. The picture at the head of these postings is of a “Chair of Elijah,” a special chair in which the sandek, the person honored with holding a baby in his lap during a circumcision, sits. 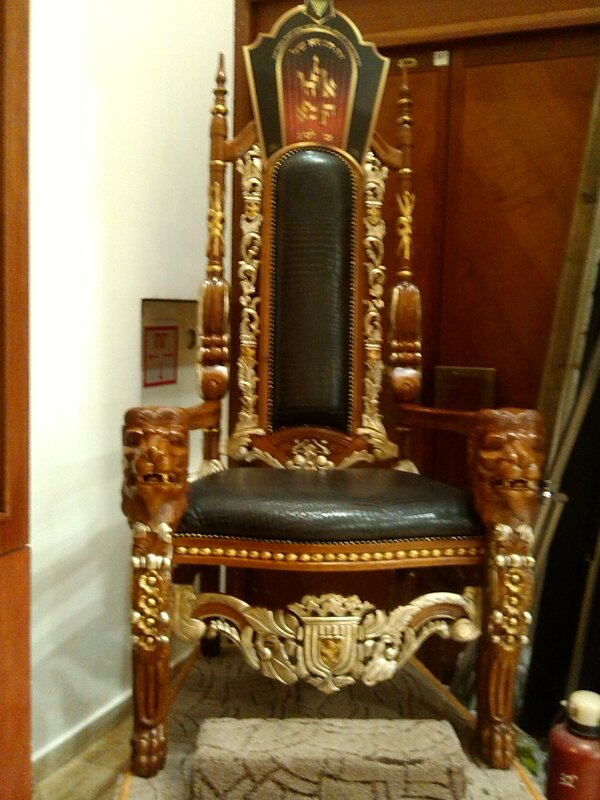 Found in the large Choral Synagogue in Moscow, this beautiful chair illustrates how precious and central to Jews is our privilege of covenantal identity. Here is the core of one of my teaching hours today, which was very helpful for people to understand what is intrinsic to Messianic Jewish Spirituality. it is a construct I devised. The Cube Model of Messianic Spirituality is a six sided cube, with each translucent side representing one of six aspects of Messianic Jewish Spirituality: Torah, Avodah, Gemilut Hasadim, Ritual Life, D’vekut, and Mitzvah. The Cube is made of stained glass, and the leading joining all the sides together is comprised of a compound of three ingredients, [acronym, EMeT]: Emunah [faith, faithfulness]; Masorah [tradition]; and Teshuvah [Repentance, Return]. The Light within the cube is the Divine Presence, and through any and all of the sides of the cube shines the image/face of Messiah who is Himself the embodiment of perfection in Jewish Spirituality in all of its aspects. The cube may be rested on any of its sides, depending upon situational and personal factors. The sides of the cube are translucent, signifying that while each each side retains its unique character, one can view the other sides [and thus aspects of Messianic Jewish Spirituality] through any one of the sides. In addition, each of these sides is illumined by the Divine Presence and each reveals Yeshua. The choice of six sides and therefore six aspects of Messianic Jewish Spirituality is arbitrary, although the model seems comprehensive. One might just as easily have chosen four or five elements, or more than six. Torah is holy instruction rooted in the Chumash, the Tanakh in itsentirety, and the sacred texts and related discussion in Jewish life, including the B’rith Chadashah and holy teachings related to it. Avodah is the life of prayer, especially liturgical prayer. Gemilut Hasadim, “Deeds of Lovingkindess” signifies tethical dimension of Messianic Jewish life, founded upon Imitatio Dei and treatment of all humans as bearers of the Divine image. Ritual Life, As per Lawrence Hoffman, is “the habitual, scripted, and repeated patterning of time so as to commuicate, preserve, or create meaning and achieve satisfaction by means of anticipation and fulfillment in a context of shared [communal] understanding.” The short definition is “what we habitually do at established intervals as a means of conveying or preserving community values, meaning and identity.” [see Hoffman, Richard The Art of Public Prayer: Not for Clergy Only]. D’vekut is cleaving to the Divine. In Hasidic circles, this is seen to occur through cleaving to the Tzaddik, the Rebbe who is seen as the intermediary between the community and Hashem. It is Yeshua who fills that function in our communal life: by cleaving to Him in faithful obedience, we experience the Divine Presence in transformation, empowerment, and intimate communion. Mitzvah is the awareness and acceptance of living under covenant nd commandment. As members of Klal Yisrael we may obey, or disobey, but we cannot avoid the commanding voice of God embodied in His commandments, which are not irksome when embraced in reciprocal love. Stained glass is used for its colorfulness, its connotation of the holy, and its translucent nature. Just as stained glass only stays together because of the leading joining piece to piece, so Messianic Jewish spirituality adheres through the presence of the compound of EMET, which means Truth. But here, it is an acronym for Emunah, Masorah, and Teshuvah. Emunah [Faith] – Messianic Jewish spirituality will not work if one is simply going through the motions. Emunah signifies not simply agreement, but rather ongoing commitment founded in trust and evidenced in faithful living. Masorah [Tradition] – Messianic Jewish spirituality is lived out in the context of Jewishcommunity both relationally and conceptually. We seek to live among, with, and as our fellow Jews, informing our practice by the canons of Jewish tradition. Teshuvah [Repentance, Return] is a lifestyle of returning again and again to faithfulness to the G-d of our ancestors, walking in his ways, and returning to those ways whenever we wander from them. It also signifies the imperative for Messianic Jews to repent of departure from the ways given to our fathers, and to return to Jewish life out of faithfulness to HaShem.